Happy new year! I’m back in the land of rock and ice and thrilled to be painting onboard the Seabourn Quest. The journey across the Drake Passage from Ushuaia to the Antarctic Peninsula region was remarkably smooth and calm. Our first stop was Half Moon Island in the South Shetland Islands, approximately 75 miles north of the Peninsula. The island is home to breeding Chinstrap penguins, and has breathtaking views of Livingston Island and eroded volcanic rock. I love the polar light and the penguins are incredibly fun to watch and paint. While painting, I’m developing my vocabulary of color, atmosphere, and shapes. I’m carrying my Art Toolkit with two Pocket Palettes, as well as my extra tripod field kit. 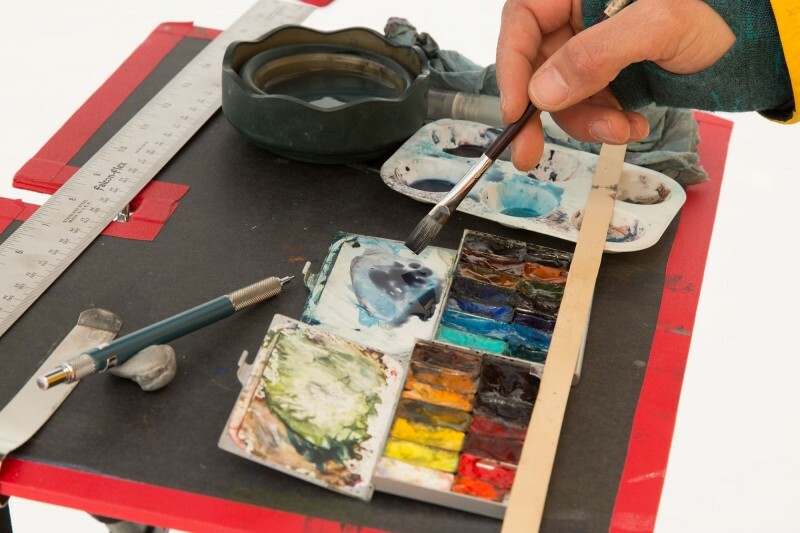 My palettes are supplemented by an extra 6 well plastic palette, and a collapsable water bucket which is helpful for painting with larger brushes. To prevent my supplies from blowing away, I use banker clips and a jumbo rubber band as anchors. 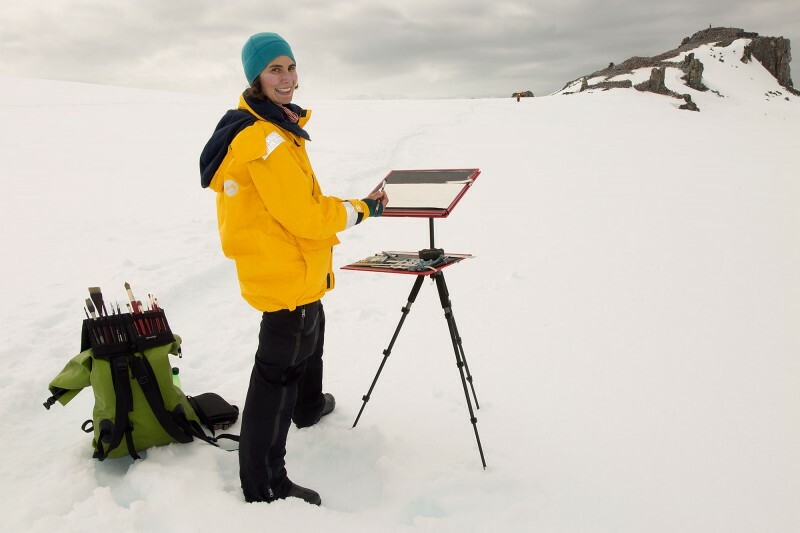 It’s great to be out painting in the elements daily, stay tuned for more polar updates! Read the next post, Antarctic Peninsula. Fantastic work, Maria! Love how the photo places your viewpoint for the “Half Moon Island” finished watercolor. Stay warm! Maria, thanks for sharing your fantastic sketches and info about your setup! I can’t WAIT to get back to the Antarctic region…there’s nothing like that light and those landscapes. And of course the amazing penguins! Looking forward to seeing more of your images. This is exciting! My first vicarious sketching trip to Antarctica. Thanks for showing your kit. I usually carry 2 of your palettes in my coffee shop kit and I sometimes use a white margarine tub lid for extra mixing space. Thank you for your lovely notes and support! It’s great fun to be down here and I’m also feeling inspired to return to my studio and develop new paintings. I love seeing your field kit and paintings! It really feels like I’m there – especially the painting at the top and the first one of the little penguins. I’m so excited to follow along! Maria, that tripod easel looks like a good one. Do you love it or do you have concerns with it? Looks like it collapses down to super small size and I like design of the two-tiered surfaces. Any problems with it taking flight in windy conditions? I assume that if you’re using it in your amazing expeditionary work it must be light weight? There are so many easels on the market and I have yet to find one that I love. Would you tell us please, what’s this one called, who makes it? Hi Karen, I’ve custom hacked my tripod easel and will try to do a detailed post on it soon with more photos and links. In short, this set-up is a lightweight Slik Sprint Mini ii tripod. I created a t-mount that bolts to my tripod and velcros to my drawing board. My shelf velcros to another custom t-mount and that clamps to my tripod. I love velcro tape! I can hang weight off the tripod in windier conditions. …makes perfect sense that YOU would innovate a design modification. I’ll look forward to reading your post on it whenever you have a chance to write it -thanks for your willingness to share! So great you took the Antarctic journey, The paintings are wonderful. 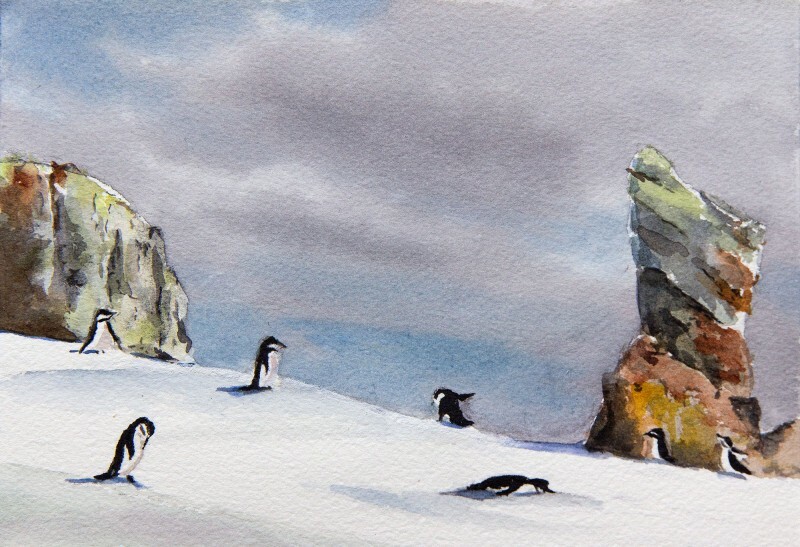 David McEown paints watercolors of the polar regions. Perhaps you know of him. He has a website: ARTISTJOURNEYS.COM.